Not many things are worse than a night of tossing and turning due to severe tooth pain or a dental emergency. Dental emergencies should not be ignored because of the risk of further damage, infection and the possible need for more extensive work or treatment later on. The best thing to do when suffering an emergency is to contact your local dentist right away. Once you visit your local dentist office it is between you and the dentist to decide what your plan of attack is going to be. Many different options from root canals to extraction will be explored based on the circumstances, listen to as many options as possible before making a decision. 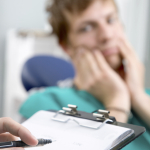 Dental emergencies can be costly, but the goal should always be to save the tooth. Once a tooth has been extracted it is not coming back without expensive cosmetic work. This is where insurance can help out in a dental emergency. The typical insurance plan covers different percentages of the procedure based on the coverage. According to Delta Dental the work is separated into different classes. Class 1: 80-100% of cost is towards preventative dental care. This includes things like your typical cleanings (Most plans cover one or two visits for cleanings, make sure to check with your provider so you know exactly what your benefits include). Class 2: 70-100% of cost is towards basic procedures. Things that fall into this category are fillings, extractions and root canals. Class 3: Around 50% of the cost towards major services. Some major services that would qualify are bridgework and impacted wisdom teeth removal. Remember, in a dental emergency it is important that you contact your dentist as soon as possible. Letting the damage worsen is only going to increase the chances of other oral problems, as well as possible costs. We serve Kenosha and the surrounding communities to help alleviate tooth pain and will address your dental emergencies. We can help you with services such as root canals, bonding teeth, wisdom tooth extraction, dental crowns and provide smart and safe advice to see you through any dental emergency. If you find yourself in serious pain, or even want to schedule some preventative care, contact us to set up an appointment today. More Kenosha families are turning to Fulmer Dentistry when they need a family dentist who combines the latest in technology with quality personal service. This is possible for Dr. Fulmer because of his deeply embedded belief in using the latest and best dental technology available to keep his patients comfortable and confident. It doesn’t hurt to have called Kenosha home his entire life either.